"Sponsored by the Chamber of Commerce, the July 4th celebration was touted as a $5,000 celebration, $1,000 of which was for fireworks. 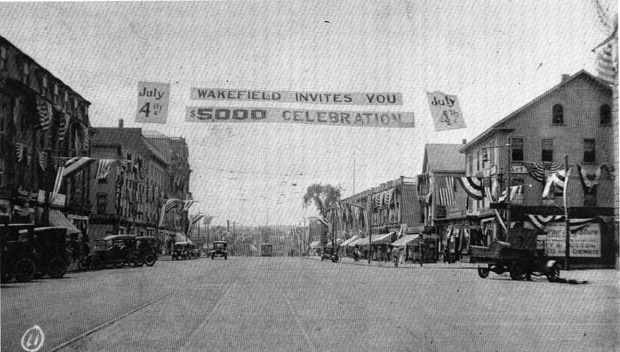 A 50 foot banner, advertising the celebration was strung across Wakefield square on a Saturday, 'just in time to catch the eye of the Sunday automobile traffic.' The banner was suspended between the roof of the Chamber of Commerce building and the Kingman Block and was of the 'net style' so that the banners advertising the July 4th celebration could be taken down and the net used to promote other town-wide celebrations. To promote participation in the parade, the Executive Committee agreed to allow prizes for floats in the following divisions: male section, fraternal finest appearance, fraternal women's section and women's organization making the finest appearance. Rain postponed or canceled many of the events which were scheduled on that day. The midnight bonfire went off as planned, as did the parade and the bell ringing at 6 a.m. The fireworks were postponed until July 6th because of dampness and the scheduled parachute jump, flying exhibition and 'hair-raising stunts by Richard Cobb and Harold D. Cates' were canceled due to low clouds. To pay for this event, every person in Wakefield was encouraged to give a $1.00 donation." -- Text from calendar by Jayne M. D'Onofrio. “Downtown Wakefield, July 4, 1922,” NOBLE Digital Heritage, accessed April 20, 2019, https://digitalheritage.noblenet.org/noble/items/show/6921.